Known worldwide as the “traveler’s tree”, the Malagasy endemic species Ravenala madagascariensis Sonn. (Strelitziaceae) is considered as an iconic symbol of Madagascar. It is a widespread species in the eastern part of the country with four different varieties which are well represented in Ambalabe community. All of them are used for different purposes and the species represents an important cultural value in the lives of the local population. However, uses of Ravenala are only generally well known by local population. Thus, in this study, we report on the different uses of Ravenala and its importance to the Ambalabe local people. Semi-structured interviews among 116 people, 59 men and 57 women with ages ranging from 17 to 84 years old, free listing and market surveys were conducted in order to collect the vernacular names, the uses of Ravenala madagascariensis and the price of plant parts sold in local market. Then, the uses were categorized according to Cámara-Leret et al. classification. Different parts of the plant are currently used by local population, which are grouped as heart, trunk, leaves, petioles and rachis. Seven categories of use were recorded, most cited include: human food, utensils and tools, and house building. The most commonly used parts are trunk, heart, leaves and petioles for which the price varies between $3-15. Uses mentioned for construction (floor, roofs and wall), human food and utensils and tools are the most frequent and salient for local population. But the use of the plant as first materials for house building is revealed to be the most important for them. Ravenala madagascariensis is very important to the Ambalabe communities because for local population, it represents the Betsimisaraka cultural and traditional use of the plant for house building. Moreover, none of its parts are discarded. 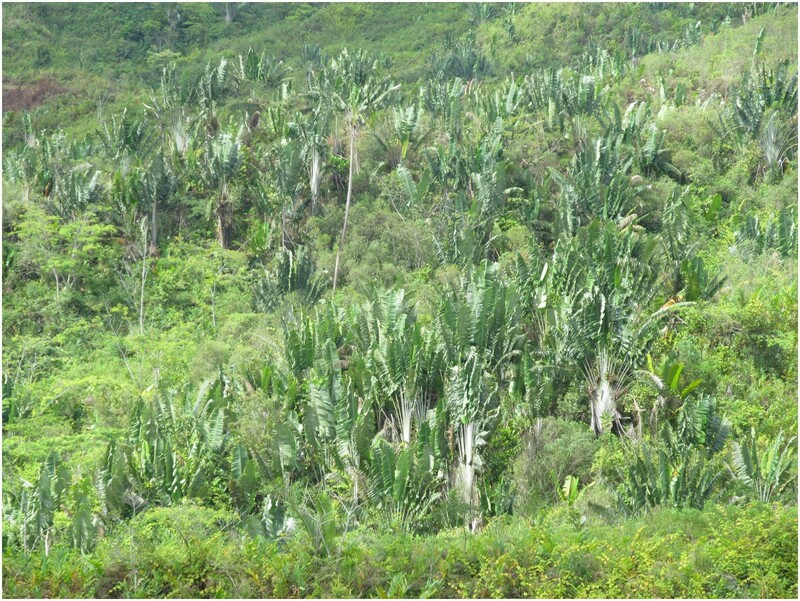 The harvest and sale of R. madagascariensis for building materials can also provide an additional source of income to the family. Besides, using Ravenala in house construction reduces the use of slow growing trees and contributes to the sustainable use of natural forest resources. Madagascar has a remarkable wealth in terms of vegetation and endemic species. The island is composed of a multitude of natural environments  which harbor a unique and globally important assemblage of plant species . In the eastern part of Madagascar, Ravenala madagascariensis (Figure 1), an endemic species also known as the traveler’s palm or traveler’s tree, is considered as an iconic symbol of the island. 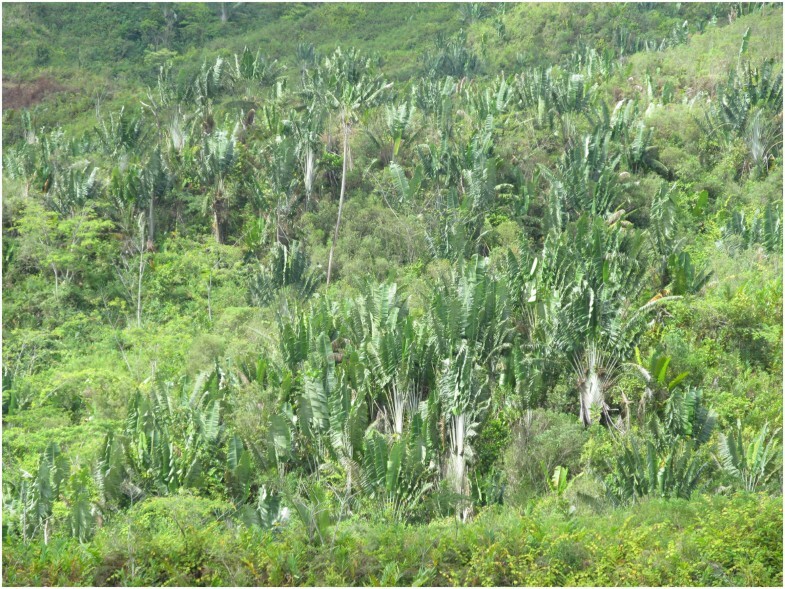 While Ravenala madagascariensis occurs in both primary rainforest and open secondary growth , it is known to form a very characteristic vegetation called “Ravenala forest” , due to the high abundance of the species (Figure 2). Population of Ravenala madagascariensis called « Ravenala forest ». Always regarded as monospecific, Ravenala madagascariensis has recently proved to be a complex aggregate of at least four recognized varieties, which might deserve the rank of species . Each variety can be distinguished according to macromorphological characters, growth habits and habitat preferences [6, 7]. Four varieties of Ravenala are well represented in Ambalabe community in Eastern Madagascar. Three of them match the three recognized vernacular names cited by Blanc et al. in 2003, such as Hirana (known before as menahirana, from which mena means red and hirana means fringes because it can be easily recognized by the sheath which is borded by red fringes), Bemavo (be means many and mavo means gray in Betsimisaraka language because of the gray powder along the sheath) and Horonorona (the name comes from its cespitose habit which is in tuft). The variety Hirana occurs both inside and outside Vohibe forest which belongs to Ambalabe commune, and the two varieties Bemavo and Horonorona are only encountered outside the forest. The fourth one which only occurs inside Vohibe forest has a red sheath and is locally called Menafalaka (mena means red and falaka means sheath in Malagasy) (Figure 3). 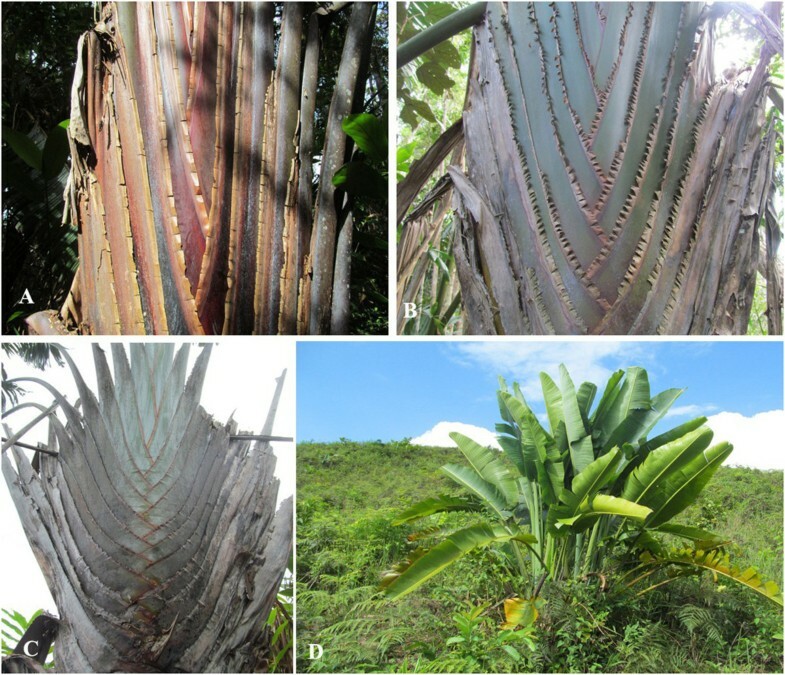 Pictures of the four varieties of Ravenala found in Ambalabe. (A) Menafalaka: found only in the forest, the picture shows its red sheath. (B) Hirana: occurs within and outside the forest, picture showing the sheath borded by fringes. (C) Bemavo: grows on deforested slopes, with the petioles covered with gray powders. (D) Horonorona: picture showing its cespitose habit. Ravenala madagascariensis is well known as an ornamental plant and is cultivated in many tropical regions. Aside from ornamental value, Ravenala appears to have many uses [4, 8, 9]. In the Ambalabe community, the four varieties are all used by local population. Our purpose was to report on the different uses of Ravenala and to assess its ethnobotanical and economic value for the local population. This study is conducted within a framework of an existing collaboration between the local population and the staff at the Missouri Botanical Garden Ambalabe Conservation Project. Fieldwork was conducted from October-December 2013 in order to collect vernacular names, the plant use and the local price of the used plant parts. A community meeting was held to explain the objective of the study in order to obtain a prior consent from the administrative authorities, traditional leaders and the local population. The surveys were done in the presence of a local guide and were conducted in the local dialect of Malagasy. 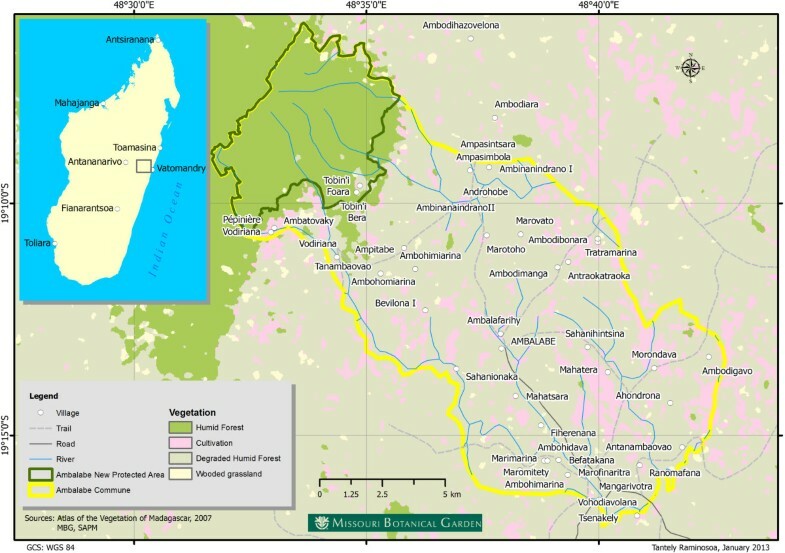 This study was conducted in the rural commune of Ambalabe, 72 km northwest of the district of Vatomandry, which is one of the 7 districts of the Atsinanana Region in Eastern Madagascar and the nearest large city and marketplace (Figure 4). Ambalabe is a very remote area, and is only accessible by road via the Provincial Interest Road (RIP) N°8, linking it to Vatomandry via Antanambao Mahatsara. The road is only passable in the dry season from August to Obtober by 4x4 vehicles up to Ambodinonoka (46 km from Vatomandry). Local people, for cost and accessibility reasons, prefer walking or using wooden canoes via Sakanila River from the village of Befatakana to Tsarasambo, or sometimes use motorcycles from the village of Vohidiavolana to Vatomandry. The whole commune covers 17,437 ha including the forest area, with a population of 10,961 inhabitants in 2013, of which 95% are farmers. About 42 villages and 1,437 households are recorded within the commune (rural commune of Ambalabe, personal communications). Location of Ambalabe rural commune. The rural commune of Ambalabe is characterized by rough topography, with valley systems with steep slopes of 10-60%, and narrow, almost reduced bottomlands. This topographical system of alternating mountain and valley typically represents the landscape in this part of Madagascar. The community is subject to a humid tropical climate  with an average annual rainfall of 1773 mm, distributed over 214 days. The average annual temperature is 24°C (75°F). Due to deficiencies in roads and to the rough topography, local populations rely on the use of plants in their daily life. 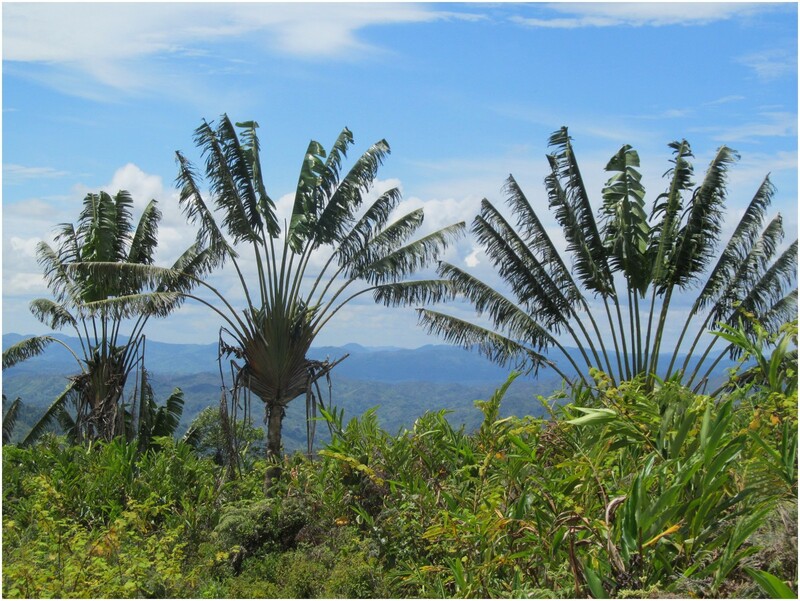 Ravenala madagascariensis is one of the most important plant resources used by local communities in Ambalabe. In order to know the different uses of Ravenala and to assess its importance, semi-structured interviews and market surveys were carried out within villages after obtaining prior informed consent [11–14] from local and tribal leaders and survey participants. Questionnaires about Ravenala were established and used as a guide for the surveys and informants were asked to cite uses they know (free list) for Ravenala and the price of materials they use (Additional file 1). Interviews were conducted in Malagasy local dialect by the four first authors, who are native speakers. A local guide acted as a dialect translator as necessary. Field walks with some participants were also done in order to identify the four varieties of Ravenala and pictures were taken. Then, uses were categorized according to Cámara-Leret et al. use category. Data analysis was performed using the ANTHROPAC® 4.0 software package [16, 17] and XLSTAT®-Pro 7.5. In this study, ANTHROPAC® was used for the analysis of free listing data. The results were expressed as frequency (%) and salience (a value that lies between 0 and 1). Frequency is the repetition of mentions during the surveys, of which one specific use of one plant part by one informant is counted as one mention. Salience is a statistic accounting for rank and frequency of the uses (e.g., one use is more salient when it appears more often and earlier in freelists) . Thus, uses that are frequently mentioned are assumed to be highly salient to respondents, and uses recalled first are assumed to be more salient than uses recalled last . Most frequent and most salient use of Ravenala is then considered as the important use of the species for the local population. XLSTAT®-Pro 7.5 was used for the analysis of variance or ANOVA in order to see the difference between men and women knowledge on the uses of Ravenala. Thirteen villages were visited during the ethnobotanical surveys and 116 people were interviewed, of which 59 (51%) were men, and 57 (49%) women. The age of informants ranges from 17 to 84 years old. Ravenala madagascariensis is generally known locally as Fontsy, but there are four varieties encountered in Ambalabe known as Menafalaka, Hirana, Bemavo and Horonorona. Three of them, such as Hirana, Bemavo and Horonorona are already recognized by Blanc et al.. In general, uses mentioned by participants during the free listing exercise correspond to the local name Fontsy. The species is used as human food, animal food, medicine, house building, tools and utensils, for environmental purposes, and also for other uses (Table 1). The frequency and the salience of each use cited were given with the table. However, some specific uses were attributed by participants to each variety depending on the used plant parts (Table 2). The plant is also known to provide seed arils and nectars which are eaten by lemurs and birds , and its leaves have an antidiabetic activity . Twenty-six types of use of Ravenala were recorded. 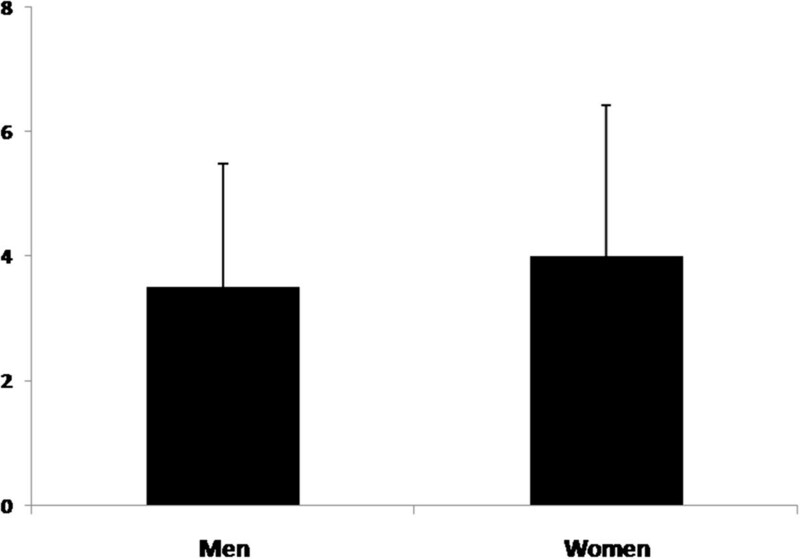 Women knew more uses (22 cited) than men (18 cited), however the analysis of variance shows that no significant difference were shown from the two genders (Figure 5), with P = 0.6 > 0.05. For both, the most frequent and salient uses cited are: floor, food, roofs, wall and rope. Knowledge of men and women on R. madagascariensis uses. All parts of the Ravenala tree are used by local people. The heart of Ravenala, locally called Ovitra of the two varieties Bemavo and Hirana, is edible and can be eaten by people or livestock. The variety Bemavo is widely preferred because it is sweeter. The variety Hirana is slightly bitter but people occasionally eat it . Ravenala is used for food especially during “starvation period”, and the heart of the plant is often used as fodder during this period as well. In terms of construction, flattened pieces of the trunk of all varieties are used for floor, but Bemavo is the most used because it has the biggest trunk. To make roofs, leaves of three varieties can be used, but Horonorona is widely preferred due to its longevity. However, using the species for rope is much more frequent because it is used whenever local people tie something, even for housing. The analysis of the use of Ravenala (Table 1) shows that the species is mostly mentioned for house building and food. As assumed by Collins et al., we considered that uses which received the highest number of mentions are the most prevalent in the communities and also of the greatest importance to people living in the villages. This means that Ravenala is primarily used as first materials for construction in Ambalabe commune, in addition to other construction materials like wood for posts or rafters. Indeed, it is almost the common use of the plant in the East Coast of Madagascar and villagers depend on Ravenala for shelter . In Ambalabe community, the species is used for traditional housing which is encountered in most villages, and also for temporary houses in the field in which leaves are also used for walls (Figure 6). The heart of the species is also used as substitute for food. It is a food rich in minerals . Frequency for each use of Ravenala was considered in this study. The salience takes in account simultaneously the number and the order of citation.This analysis highlights the important use of Ravenala in house construction (floor, roofs, wall), and for food. Housing structures built with R. madagascariensis. (A) Traditional house structure seen in Ambalabe using petioles for wall. (B) Temporary house structure built in the crop field with leaves used for roofs and wall. As far as the economic value of Ravenala is concerned, we only considered the two varieties, Bemavo and Horonorona, which are encountered outside the forest. These varieties are more easily accessible for local population than the two others which mostly occur inside Vohibe forest. Besides, the use of plants from the forest is regulated by community rules called dina. For example, plants used for house construction, beehives, medicine, ferment for local alcohol drink, or dead trees for fuel can be taken from the part of the forest which is intended for traditional uses. However, those used for house construction, beehives and ferment always need authorization from the president of the local community-based regulation committee (locally called Vondron’Olona Ifotony or VOI) who regulates the use of forest products. If the trees are used for personal purpose, duty should be paid in advance in order to get the authorization, which can last for 3 months. If needed, it can be renewed after this period. Furthermore, it is noted that plants taken from the forest cannot be sold, but for personal use only. Thus, leaves, petioles and trunk of Bemavo and Horonorona are the parts sold in the market. Table 3 represents the variation of the price of the plant parts used to build houses and the expected longevity of the materials. An example of a house with 12 m2 floor area was taken. In this table, the price and the longevity depend on the type of materials needed and the variety of Ravenala used. Horonorona lasts for roofs while Bemavo for floor and wall. Materials need to be periodically renewed, usually at least every 3 years. Even though local populations are aware of the material’s short life span, they still use Ravenala because culturally it is the primary materials used for house building in the Betsimisaraka tribe. It is then a way to identify and preserve this culture. In addition, local population do not know how to manufacture bricks (personal communications), yet the plant is still abundant and easily accessible. Besides, it is an easy material to work with, allowing for fast house construction, which is particularly meaningful in Eastern Madagascar where cyclone damages are quite frequent . In addition, Ravenala is a renewable material, and is inexpensive. Local populations also can directly take for them the materials they need without buying from others. On the other hand, Ravenala provides a source of income which can improve or stabilize some people’s life. The raw materials (leaves, petioles, and trunk) can be sold directly to people in need who cannot go to collect the materials, and handicrafts made from Ravenala, such as winnowing trays or baskets, can be sold in local markets. Ravenala madagascariensis remains an important component in the life of local population in the Ambalabe Rural Commune, especially for house building. There are four varieties of Ravenala madagascariensis found in the study area and all of them are used. Ravenala is used primarily for construction, but other uses have also been noticed including food, medicine and tools. Using Ravenala for house building reduces the pressure on some forest trees, which contributes to the conservation of natural forests and slow growing hardwoods. However, mature trees are needed to source construction materials, and these have become increasingly scarce. While the local population has developed some practices to increase the numbers of large trees, strategies for long term management and sustainable harvests need to be developed. This research was made possible with the financial support from the William L. Brown Center, Missouri Botanical Garden, in collaboration with the University of Antananarivo. We wish to express our thanks to them, to the staff of Ambalabe project, and to the Ambalabe community and the local population who contributed in this research. We also thank the local guides for their time and sharing their knowledge. We gratefully acknowledge courtesies extended by the Government of Madagascar (Direction Générale des Forêts) and by the Association Nationale pour la Gestion des Aires Protégées, as well as the local authorities in Ambalabe Rural Commune. All authors participated in the study design and drafted the manuscript. NR, AR, FR and LR carried out the study and analyzed the data. All authors read and approved the final manuscript.